On Sunday night, I watched episode one of The Vikings, a new dramatic series on the History Channel that begins with the ambitions of an 8th century Scandinavian warrior and farmer, Ragnar Lothbrok, who has heard rumors of wealthy places to the west called England and Ireland. I was especially interested in the series after visiting Iceland last fall and delving into Icelandic sagas which chronicle the same culture 200 years later, after they’ve mastered the art of navigation on the open sea. (search on “Iceland” on this blog to see the writings and photos that followed that trip). All the details on episode one fit what I learned in terms of historical accuracy. I’m looking forward to watching the next eight episodes in the series. Episode one depicted a violent culture, but one with its own detailed code of honor. In that respect, it mirrored the Old Testament world presented in episode one of “The Bible,” which came on next on the History Channel. Plenty of smiting in both cultures. I recommend the series. Anyone who is interested can check out episode one on Hulu: The Vikings on Hulu. This entry was posted in Entertainment, History, Movies and tagged history, movies, The History Channel, TV, Vikings. Bookmark the permalink. Thanks for reminding me about this series. I had heard about it and forgotten to set it up to record. Fortunately, they rerun these episodes many times, so I haven’t missed the first show. Looks like a good one. The History Channel knows how to make shows that fascinate and are fairly accurate. Yes, the paper shows a repeat tonight – with a three hour time difference, which would put it at 7:00 or 8:00. In one part, I was reminded of Bob’s story detail concerning navigation without a compass. So I plan to tune in for the remaining episodes. I pray for no horned helmet and some social/political insights on the Viking culture. The violence will be a given and necessary to satisfy viewers, but the social intrigue and codes are what make the written/oral sagas so intriguing. Glad to get a heads up for this one. Unlikely to see this series here in the UK, but it sounds intriguing. Interesting you should mention their code as resembling that of the Old Testament, as I suspect that that similarity may have helped paved the way for their eventual conversion to Christianity as it did for the Anglo-Saxon culture in England. I’m afraid though that I can’t hear the phrase ‘The Vikings’ without being reminded of the romping good film of the same name with Kirk Douglas, Tony Curtis and Janet Lee. And the theme tune. Played on a Scandinavian version of an Alpenhorn. 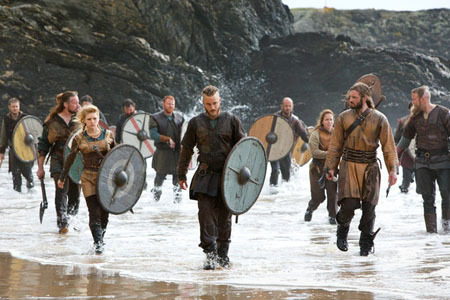 The first two episodes are available here – hopefully more as the series continues:http://www.history.com/shows/vikings. I didn’t mean to suggest a parallel between Old Testament culture and the Vikings beyond a militant ethic, which I observed because the two programs were back to back. At least in the story of the conversion to Christianity for the Icelanders, as a part of Njal’s Saga, its an opposite mindset from the ancient Hebrews. The Icelanders debated the merits of the two religions at the Allthing, as they would debate the merits of any public policy. There were other factors at play as well – the warrior ethic that may have once served isolated bands of raiders was tearing the population apart during its transition to a farming economy in a difficult climate. Beyond that, I don’t think the Norse people carried the hubris of imagining themselves as a chosen people (oh, did my bias show a little bit…?). I prefer to see the supposed bias as critical reflection. And I’m very grateful for your putting the Icelandic position clearly; I’d forgotten about the Allthing debate! What I said about the Anglo-Saxon conversion still holds though, I think: The Dream of the Rood, for example, recrafts the Crucifixion as a pagan vision, and Beowulf mixes bits of OT lore (the offspring of Cain for instance) in with the heathen themes such as ship burial. I’ll have a look at the link, so thanks for that! I am glad you reminded me. I saw a preview for this a while ago and I thought it looked like it would be very interesting. Then…I forgot all about it. I am checking out your links and will find the show. Thanks!